1891 A HAND ILLUSTRATED ENVELOPE FROM CHESTER TO BANBURY depicting a superb drawing in pen and ink of a Butterfly. 1760 Entire addressed to London showing a straight line BISSITER with Lines above and below, OX 36 - last year of use? - together with a superb London Bishop mark for 12/SE. 1826 Entire to Newport, I.O.W., showing on the reverse a SUPERB FRAMED ADDERBURY/5" Cls:Post. RARE. 1840 Cover addressed to Portsmouth showing a superb MARLBOROUGH UNIFORM HANDSTRUCK 'PAID/1', WL 451, in Red, and a very fine Missent to/Oxford in black. SUPERB! 1934 A Registered envelope addressed to Aylesbury, Bucks, franked by three 1½d Red-Brown, SG 420, one being se-tenant with an attached label from a rare booklet pane tied by Oxford circular datestamps together with a BATH SHOW/OXFORD label. 1788 Entire to Blandford, Dorset showing on the front a superb 57 OXFORD first-type mileage. SUPERB. 1865 Envelope from Stirling to Henley showing on the reverse a very fine boxed "SOUTH-WESTERN/R.P.O." in black, W 417. Scarce. 1841 JULY 11TH 1d RED-BROWN, SG 7, PLATE 1B, lettered D-E. A SUPERB LARGE FOUR-MARGIN EXAMPLE TIED TO NEAT SMALL ENVELOPE addressed to SWANWICH (Swanage) by a SUPERB OXFORD MALTESE CROSS - RARE THIS FINE! SUPERB!! 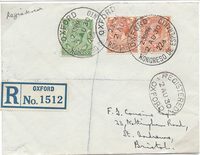 1930 Registered envelope to Bristol franked by George V ½d Green, SG 428 and 2d Orange, SG 421 x 2, tied by OXFORD/KONGRESO DE ESPERANTO 2 AU 30 cds. 1803 Entire to Olney showing a very fine TETSWORTH/45 mileage, OX 204. 1839 DEC 11th Entire to East Dereham showing a very fine OXFORD UNIFORM MANUSCRIPT '4' in black. 1863 Envelope from Leamington to Farringdon showing a very fine 'L&E' in six-pointed star of the LONDON & EXETER R.P.O., W 298. 1790 FREE Entire from London to Wheatley, Oxfordshire, showing A FINE CIRCULAR-FRAMED 'FREE/P', L 772. 1840 1d Mulready Envelope, Forme 2, Stereo A153, addressed to Oxford and cancelled by a superb ORANGE BRISTOL MALTESE CROSS. Superb and Very Attractive. 1804 Entire from "ALL SOULS COLLEGE" Oxford to Gloucester showing a fine OXFORD/57 mileage - Interesting content regarding a recipe for baking a pie! 1860 Mourning envelope to London with, on the reverse, a very fine circular-framed MIDDLETON-STONEY (Bicester) undated circle. 1872 1d Rose-Red, SG 43, Plate 130, tied to envelope to Bournemouth by a fine OXFORD 613 NUMERAL DUPLEX ERROR FOR 603. 1794 Cover to Aylesbury showing a very fine concave OXFORD. 1790 Entire to London with, on the front, a very fine '57 OXFORD' first-type mileage. 1851 Envelope to Bognor with, on the reverse, a very fine BRIZE-NORTON (WITNEY) undated circle in Blue. 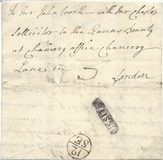 1843 1d Pink Stationery envelope from Streatham to Oxford cancelled by a VERY FINE No 6 IN MALTESE CROSS. Letter enclosed - Sick undergraduate wirting to his friend after a long absence from college. 1840 Entire from Adwell (Oxf) to Gloucester showing a very fine 'Missent to/Oxford', OX 194. 1868 1d Rose-Red, SG 43, PLATE 95, BLOCK OF FOUR tied to envelope to France by very fine OXFORD 603 duplex.